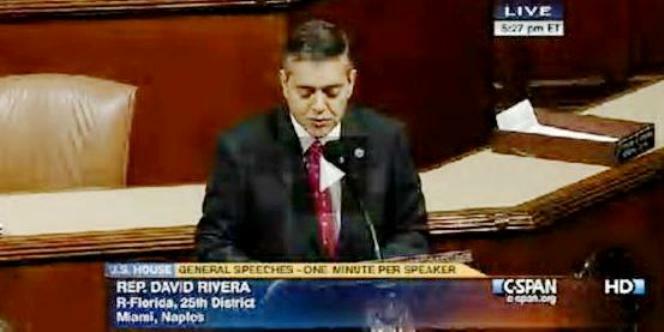 C-Span, Congressional Record (Washington, DC, Dec. 13, 2012) — Yesterday, Rep. David Rivera, a Member of the House Foreign Relations Committee from South Florida, addressed the House of Representatives to voice his support for the Moroccan Autonomy Plan to resolve the long-running Western Sahara conflict, as well as his criticism for the Polisario Front. Mr. RIVERA. Mr. Speaker, like all of us in Congress, I believe in the greatness of the American people and the preeminence of our principles and rights that have made America a beacon of hope and freedom, but there are still many around the world who yearn for basic human liberties. The Sahrawi people of Western Sahara have been trapped in oppressive conditions for over 30 years, with the support of the corrupt Algerian Government and its puppet regime, the Polisario Front. The Polisario Front has instituted mass kidnappings of Sahrawis from their homes into the Tindouf region in western Algeria. The majority of these refugees have remained warehoused and imprisoned in Tindouf’s sprawling camps for 35 years. The Polisario collaborates with the likes of Cuba, whose military rations food in the camps in exchange for loyalty to the regime and indoctrinates children who have been stolen from their parents, all while partnering with al Qaeda and the Maghreb. The Government of Morocco has advanced an autonomy plan, which I will submit at a later time, that addresses these issues with a clear and democratic solution to the long, drawn-out Sahara crisis. This is where America’s support should lie. Mr. Speaker, the United States can and must continue to advance fundamental human rights, freedom, and democracy as we, in this Chamber, continue to work together for peace, justice, and human dignity in the Western Sahara.